It all started with Dr. Walter Good and his twin brother, Bill, in 1937. They could never have imagined what the hobby of RC model airplanes would be today. I’ll take you with me as we travel along the timeline of RC development since the Good brothers made their historic flights at the Kalamazoo, Michigan, airport. Those first flights were made with an 8-foot Free Flight (FF) model into which the brothers installed their primitive RC equipment. They designed and built their Big Guff airplane in 1938 specifically for RC. That same year, Ross Hull, an avid modeler from Australia, flew a 13-foot RC glider at a famous glider site near Elmira, New York. As early as 1938, Leo Weiss was recognized as describing the first tone reed system, an eight-channel radio system. Raytheon developed its ultrasensitive RK-62 tube, which enabled the development of the single-tube receiver. Howard McEntee published details with schematics for his twin-frequency transmitter in 1939. One of the earliest publications of a multifunction, single-channel RC system was by Thracey Petrides and Leon Hillman in 1941. The U.S. Army used RC airplanes called Radioplanes as artillery target drones during World War II. FCC Order 130-C went into effect on March 1, 1946, and created the 6-meter band allocation for the amateur service as 50 to 54 MHz. Many modelers, such as I, quickly learned some radio theory and Morse code to be able to fly on the 6-meter band, which gave them an almost personalized frequency at local fields. The Good brothers, Bill (L) and Walt, at the 1940 Nats. The pair won the RC Nats in 1938, 1939, and 1940. Photo by Ted Just. The first examination-free frequency was provided by FCC in 1949. It was 465 mc and was limited to 5 watts. That same year, Ed Rockwood developed a multichannel system, which was the first commercial venture for an audio-frequency-modulated reed radio. Jack Albrecht built what is thought to be the first handheld transmitter in 1956. Bob Dunham started Orbit Electronics in 1958 and produced a popular reed system with a handheld transmitter. Before this, several top pilots were flying Bramco radios with ground-based transmitters. Bramco quickly saw the popularity of handheld transmitters and began producing its own. This reproduction of the Good brothers’ radio was built by Wes DeLong using plans in the December 1940 issue of Air Trails magazine. The magazine covered building the Big Guff and the radio throughout several issues. Reproductions of both the airplane and radio can be seen in the National Model Aviation Museum. 1960 saw the first commercially available proportional system, Space Control, introduced by Zel Richie. Space Control was engineered by Hershel Toomim and produced by his company, Solidtronic, in Van Nuys, California. Meanwhile, in 1960, Don Baisden submitted a proposed article to Grid Leaks magazine on his single-channel Galloping Ghost pulser and another for his rudder-only pulser that was later kitted by Ace RC. Also in 1960, Howard McEntee came up with a simplified version of a pulse-proportional system that used only a single tone and added the feature of being able to vary the pulse rate of the tone, as well as achieve a second function with only one tone. Howard’s system was referred to as the “Kicken Duck” because the control surfaces flapped like a duck’s wings. More advances were seen in 1961 as the Bonner relayless servo, the Transmite, became commercially available. The first jet model was flown with a Dyna Pulse Jet and a reed radio system. It had Jerry Nelson as the pilot. Don Brown built his first Quadraplex proportional RC system by hand as Carl Schwab, who designed the electronics, provided advice and assistance by telephone. Don Baisden proposed an article to Grid Leaks magazine on his single-channel Galloping Ghost pulser and another for his rudder-only pulser, which was later kitted by Ace RC. The first commercial digital RC system was flown by Doug Spreng. The radio was named Digicon. 1962 also saw the first commercially produced four-stick proportional radio, the Astroguide, by Klinetronics. In 1963, Howard Bonner’s name was in the news again when he introduced his eight-channel Digimite system. One of the most significant developments arrived in 1965 when the FCC granted five frequencies on 72 MHz band with 80 kHz spacing. In 1966, Proportional Control System’s (PCS) revolutionary low price of $299.95 for a complete proportional system with servos and batteries shook the RC world to its foundations and led to the demise of several competing manufacturers. Most of the systems at the time sold for approximately $500. Phil Kraft introduced his Gold Medal Series proportional system in 1968 after winning the gold medal at the Corsica, Italy World Championships. Toy company Mattel entered the RC hobby with its inexpensive, single-channel pulse-proportional system that sold for $29.95. The first Controlaire three-channel proportional prototypes appeared and were built to explore the concept of a more affordable three-channel alternative to Controlaire’s full-house proportional system. Bob Elliot designed a servo amplifier that reduced the servo wires from six to three. In 1969, frequency-modulation and pulse-code-modulation receivers were introduced. A few years later, in March 1975, Orbit Electronics displayed the Elite “super radio” in Westchester, New York, at the Westchester Radio Aero Modelers’ trade show. It had an LCD display panel. That same year, transmitter features included servo reversing, adjustable travel, and dual rates. A year later, toy company Mattel entered the RC hobby with its inexpensive, single-channel, pulse-proportional system that sold for $29.95. Also in 1976, Kraft Systems introduced the first synthesized RC system. This radio system allowed the operator to change frequencies using the same transmitter and receiver. It had electronic circuits that generated a range of frequencies from a single reference frequency. Here is an early Quadraplex. Don Brown hand-built his first transmitter and receiver. Carl Schwab, who designed the electronics, provided advice and assistance by telephone. A major improvement to RC systems came in 1982 when JR Radios offered an array of programming features. These computer radios allowed pilots to program the transmitter for many different models. The programming started with naming the airplane, and then setting various parameters such as servo direction, servo travel limits, dual and triple rates, mixing of various controls, and exponential travel curves that could be customized for each pilot and model. In 1987, the FCC granted additional channels on the 72 MHz band, and the following year granted more channels on the 72 MHz band, with 20 kHz spacing referred to as narrow band. In 2004, the first commercial RC system using spread spectrum technology was introduced by Spektrum. 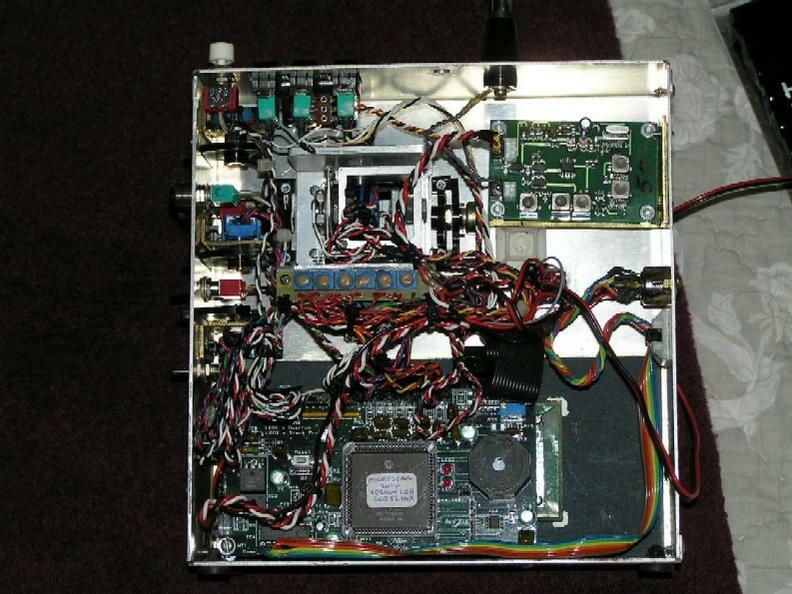 It operated on 2.4 GHz. Paul Beard developed spread spectrum modulation (DSM) using 2.4 GHz. PCS’s revolutionary low price of $299.95 shook the RC world to its foundations and led to the demise of several competing manufacturers. In 2011, Futaba introduced Futaba Advanced Spread Spectrum Technology (FASST). The next year, Futaba introduced S.Bus protocol using one signal cable to control multiple servos. Improvements in reliability with lower costs have continued to the present. I’m sure I missed some milestones along the road of RC development, but I believe that I captured enough to give you a picture of how our great RC model aircraft hobby has progressed since the Good brothers started it off in 1937. Howard Bonner introduced this eight-channel Digimite system. 1937: Twins Walt and Bill Good, only age 21, made their first flights at the Kalamazoo MI, airport after adding RC to their 8-foot gas FF model named KG-8. 1937: Australian Ross Hull went to Elmira NY, and flew a 13-foot glider with RC. 1938: Walt and Bill Good built the first airplane designed for radio control, the Big Guff, and placed first at the AMA Nats. 1938: Leo Weiss describes an eight-channel, audio-tone reed system for model airplane radio control he had under development. 1938: A new type of tube was introduced for radio control that enabled the development of an ultrasensitive single-tube receiver: the RK-62 by Raytheon. 1939: Howard McEntee published twin-frequency transmitter details with schematics. 1941: Early multifunction single channel published by Thracy Petrides and Leon Hillman. 1940: During WW II, the U.S. Army and Navy used RC airplanes called Radioplanes as artillery target drones. 1946: FCC Order 130-C went into effect on March 1, 1946, and created the 6-meter band allocation for the amateur service as 50–54 MHz. 1949: First examination-free frequency allowed—465 MHz and 5-watt maximum power. 1949: Ed Rockwood’s multichannel system was the first commercial venture for an audio-frequency-modulated reed radio. 1952: 27.255 MHz available with no test and a 5-watt maximum. 1953: Frank Schmidt made and sold a complete, five-channel reed set based on the Rockwood design. The National Model Aviation Museum displays many radios and visitors can leave Post-it notes detailing their recollections of these radios. 1955: Bramco Inc., in Detroit, entered the RC business with its Blue Chip reed system. 1956: Jack Albrecht built what is thought to be the first handheld transmitter. 1956: Bob Dunham started Orbit Electronics and produced a popular reed system. 1957: Walter Good published his TTPW transmitter for a dual-proportional system. 1957: Zel Ritchie built a handheld, solid-state version of Walt Good’s TTPW transmitter. 1958: FCC granted five additional frequencies at 50 kHz spacing on the 27 MHz band. 1959: Ken Willard flew indoor model using an .020 engine weighing only 33/4 oz. 1959: Al Doig introduced his Ulti Multi closed-loop, feedback, non-wiggling, multiproportional system. 1959: Relayless reed system was flown by Louie Scheel and Ken Oliver. 1960: Bramco, Inc. introduced its Control Box Transmitter, which was advertised as the control box for controlling a model with the reflexes and coordination of a real pilot. 1960: First commercially available proportional system, Space Control, introduced by Zel Richie. Space Control was engineered by Hershel Toomim and produced by his company, Solidtronic, in Van Nuys CA. 1960: Don Baisden submitted a proposed article to Grid Leaks magazine on his single-channel Galloping Ghost pulser and another for his rudder-only pulser, later kitted by Ace R/C. 1960: Howard McEntee came up with a simplified version of pulse proportional that used a single tone, and added the feature of being able to vary the pulse rate of the tone as well to get a second function with only one tone. 1961: Howard Bonner’s relayless servo, the Transmite, became commercially available. 1961: First jet model flown with Dyna Pulse Jet and a reed radio system had Jerry Nelson as pilot. 1961: The hand-built Quadraplex transmitter and receiver were by Don Brown. Carl Schwab, who designed the electronics, provided advice and assistance by phone. 1962: The first commercial digital RC system flown by Doug Spreng. The radio was named Digicon. 1962: First commercially produced four-stick proportional radio, the Astroguide, by Klinetronics. 1963: Howard Bonner introduced this eight-channel Digimite system. 1964: Howard Bonner introduced the Transmite servo for relayless reed receivers. 1965: FCC granted five frequencies on the 72 MHz band with 40 kHz spacing. 1966: PCS’s revolutionary low price of $299.95 shook the RC world to its foundations and led to the demise of several competing manufacturers. 1968: Phil Kraft introduced his “Gold Medal Series” system after winning the gold medal at the Corsica, Italy, World Championship. 1968: The first Controlaire three-channel proportional prototypes were built to explore the concept of a more-affordable, three-channel alternative to Controlaire’s full-house proportional system. 1968: Bob Elliot designed a servo amplifier that reduced the servo wires from six to three wires. 1969: FM and PCM receivers were introduced. 1975: Orbit debuted the Elite “super radio” at the March 1975 WRAM Show. It had an LCD display panel. 1975: Transmitter features were increased to servo reversing, adjustable travel, and dual rates. 1976: Mattel, the toy company, entered the RC hobby with its inexpensive single-channel pulse-proportional system that sold for $29.95. 1976: Kraft Systems introduced the first synthesized RC system. 1982: The first computer transmitter was introduced by JR Radio. 1987: The FCC granted additional channels on the 72 MHz band. 1988: The FCC granted additional channels on the 72 MHz band with 20 kHz spacing referred to as narrow band. 2004: Paul Beard developed DSM using 2.4 GHz. 2012: Futaba introduced S.Bus protocol using one cable to control multiple servos. A brief summary of The History and Evolution of RC by Don Gray and Giuseppe Fascione, March 2006. I was very impressed with this quick look at the history of model aviation. What would be so cool is if there was a series of stories that would go in-depth into the history. I'm sure a lot of people would enjoy reading this for the first time and for those who did those things, a trip down memory lane. 1898: Nikola Tesla and remote control boat were omitted. The article said that the first handheld TX was in 1956. I had a Berkeley Super Aretrol that I got for Christmas in 1953 that had a hand held TX. Wasn't the most reliable but did work with constant tweaking. Flew it in a DeBolt Live Wire. A good day of flying was one without a flyaway!! I also got a Super Aerotrol Tx and Rx as a Christmas present in 1953. I had the pleasure of knowing and flying with Walt in his latter years. What a fine gentlemen. Although suffering from mild dementia, he still flew like a champ. RIP my old friend. I had one of these Mattel systems, similar to the much better Ace Pulse system. Answering an ad in RCM, me and my buddy Robert both ordered one. I was disappointed in its lack of range, not enough to fly any size model. Robert's had the same problem. Mattel thoughtfully included a complete receiver schematic, which revealed the problem. After the I.F. amp, the AM detector consisted of a silicon transistor with no bias, which wouldn't start to work until about .6 volts was received from the receiver, available only at very close range. We replaced it with a germanium transistor which restored normal range and it worked as well as any other receiver. Not sure what happened to Robert's Mattel but we had many flights until my Nomad wing folded at high altitude. The magnetic actuator didn't survive the crash and no more parts were available. Why Mattel never fixed such a simple problem is unknown. GREAT INFO. I just recently flew an Ace Dicks Dream with my Mattel and had continuous range issues where I would lose contact with the plane! On the 3rd flight, it spun into the ground due to no radio contact. Can you give me a clue on the model germanium Xstr you recommend? "1956: Jack Albrecht built what is thought to be the first handheld transmitter." I have been flying RC since the early 40'S and ALL of my transmitters were hand held. Really good article but Single channel push button radios with rubber band and later servo excapement was not addressed in this article also we were using the 72mhz frequencys in the early 1980's. With single channel and only one button I could control rudder and throttle. one push of the button was right turn two was left turn and three pushes would put the throttle on half speed until you released the button. First "Knobby" or single-stick (3-axis-joystick) radio? I've always wondered - since I HAVE to stick to flying RC solely with a three-axis-joystick ("knobby" or "single-stick") equipped transmitter, if the Don Brown-designed Dee Bee Quadruplex was the VERY first commercially-available RC transmitter to use a three-axis joystick? 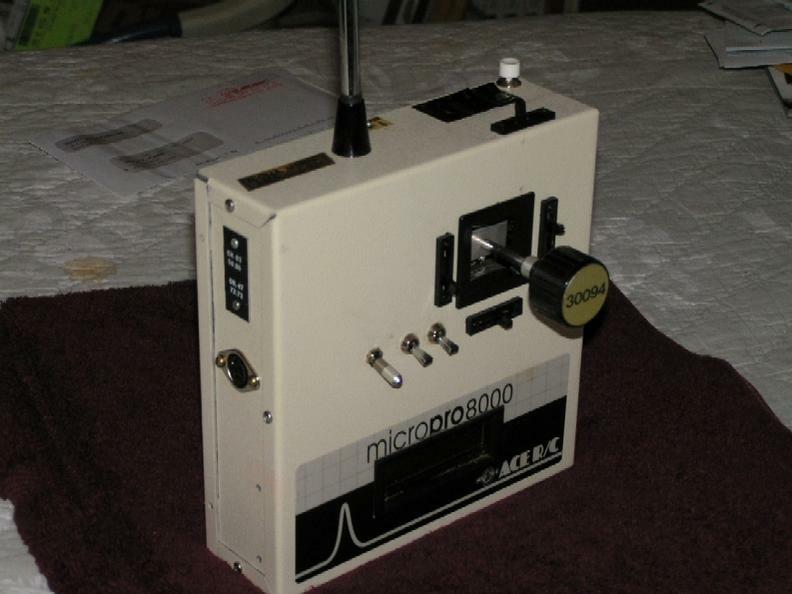 My own latest "knobby box" (one of an intended matching pair for 50 MHz Ham use - I've been a Ham since 1978) uses the Gordon Anderson-designed MicroStar 2000 encoder, and can be seen at https://static.rcgroups.net/forums/attachments/2/8/8/7/7/a7330522-79-a45... , and at https://static.rcgroups.net/forums/attachments/2/8/8/7/7/a7330524-38-a45... for an "inside" view of it. The backbone of RC in my area in the early 60s were the Bonner escapements. They allowed single channel control of rudder, elevator(if you were lucky), and engine (if you were lucky and a genius). The high tech guys were the ones with electric winders for the rubber bands that powered the escapements. Contests were usually won by the flyer who actually got the plane back on the ground in one piece. I saw my first rudder-only loop at Pensacola Nats (whenever that was). Well, license free R/C came much later than 1952! My first R/C set was an Ace R/C single channel pulse proportional unit that my brother and I installed in an Eldon foam glider. It came with an FCC license application. I got my first multi channel R/C set in 1974 or '75, ( an EK Logictrol 4 channel brick system) and it had an FCC license application in it also. It was $25 dollars for a 5 year license and about the same time, the CB craze exploded and a voice license was required at $25 for 5 years also. I still have both of mine around here some where! The crush of the license applications caused the FCC to drop the requirement, as I recall. I flew R/C sailplanes exclusively at that time and got to know Tom Runge and the Ace R/C gang very well. I had the pleasure of meeting Walt Good at the second ever electric R/C World Champs held here in the St. Louis area in 1988. A very nice man, and his eyes got pretty wide when I introduced myself and he heard my last name! I flew a Debolt Live Wire Senior powered by a Fox 19 2 speed with a Bonner Compound Escapement in 1952-53 at Eastridge in Westchester Co. I thought I might mention that the big transmitter wasn't a problem other than lugging it onto the field because with the single channel pulse systems all you needed was a small switch button on a 6-8 foot cord. The big innovations were the Bonner Compound Escapement which meant that you needn't remember whether right or left was coming up next. One click gave you right and two gave you left. Before that, I lost or had to spin in ships when they got too far down wind. The second was the purpose designed RC airframe, the Debolt Live Wire. FF ships were designed for high climb rates and low drag. That meant that they were difficult to keep upwind and had to be spun down frequently. And they accelerated rapidly in the spin, endangering the light wing structure in the pull out. The Live Wire mitigated both of those problems making it much easier to keep the ship in the field. The Bonner Compound Escapement had a third position just off neutral. Three pulses closed a switch which in turn keyed a second escapement which moved the engine from the high speed needle to the low speed one and visa versa. On low speed the ship would glide down and on high it would climb. If you held the third pulse the engine would quit. My concern went from flyaways to: Would the prop break on landing? The ship did fly away twice when I failed to put enough turns in the escapement, but we recovered it and it sits in my basement with it's Miller 2 Tube Radio and Sigma 4f relay, uncovered now but otherwise nearly ready for another flight. After that I went off to engineering school and proportional control took over. One of the sophisticated techniques was pulse position modulation. Dr.Walter Good was at Johns Hopkins where I believe he did work on those military guidance systems and I have always wondered at the coincidence of the technique making its way into RC in those days. Got my start in RC with a second-hand Lafayette one-tube, single channel radio system and simple and compound rubber-powered escapements. Sure was a lot of fun just getting the system to work at all. Used three different batteries just in the transmitter and two in the airplane. Next system was a 10 channel Citizenship reed system. Thumbs sure got tired pulsing the buttons to create a smooth turn! Was sure happy when Kraft and Ace came out with true proportional systems. Still loved playing with the little Ace single channel pulse system with a magnetic escapement. Just an advanced version of the old "galloping ghost" method of control. Oh, the good ole days! Now you just buy a RTF, charge the battery and throw it in the air and fly. My 4 year old great-grand-daughter flew one successfully first time. We've come a LONG way, baby! So proud to have lived and seen it all happen! I also enjoyed reading about the history. I started in 1956 and flew with a ground based transmitter with a 9 foot antenna and one push button. My Dad bought me a Buccanesr C special back in 1947. The eng. to go with it was and still is a "C" class motor known as the Rocket Motor. I still have the motor. I built the plane back than but didn't get to fly it. We moveed from Conn. to NH and it get distoryed with the move. I enjoy this subject. I started out in 1956 with the Radio control club of Detroit I have been a member now for 63 years. I started out with a ground mount transmitter with a nine foot antenna and a single push button. I am still very active today and enjoy every minute of it. Along the way I have been privileged to meet hundreds of members with similar interests. Around 1963, give or take a year, I flew single channel (transmitter had only one button to press) with a servo that had an arm on each side for a pushrod on each, one for rudder and the other for elevator and a wheel on the top for a third push rod for throttle. To operate: A single press and hold would give right rudder, press twice and hold for left rudder, press three times and hold for up elevator and press four times and hold for down elevator. Everything went to neutral when the button was released. A quick press and release would drive the throttle from high to low alternately. Is there anyone out there that is familiar with that servo? Nice YouTube presentation by Tony Stilman. I'm proud to point out that my dad's ground based transmitter is in the display case. It is the large black box close to the Good brothers radio. He built it from a magazine schematic around 1958. It has an ACE R/C control stick. His airplane, a Berkeley Bootstraps, hangs above the museum's hobby shop. We last flew it in 1966. Dad is 92 and still building models and he instilled his love of RC in me. I've been flying for 50 years. A fascinating story and nice pics - thanks! Just might want to make a minor correction: While it's rapidly becoming a "lost language" even amongst the HAM radio community, it's Morse Code, not "Morris". I think Bob meant to say something about Albrechts transmitter being one of the 1st hand held multi-channel reed types, as there were many single channel handheld transmitters. Probably it was just a small omission on Bob's part, but in any case Jack Albrecht made some significant contributions to R/C back in the early days. At any rate, Bob, what a great article and it is very hard to cover all aspects and details of the development of R/C. One must realize that there were many guys early on who built one-off systems, some of which were never published or well known, and many are now lost to history.